Pet insurance is a must in today's world: image via petside.comHave you taken your dog or cat to the vet's office lately? Then you know that a routine checkup can end up costing between $100 and $200 once the exam, tests, and vaccinations are added up. And even in these times of hardship for many pet owners, veterinary costs keep rising. That's one reason to get pet insurance for dogs and cats, and perhaps other pets as well. Then, of course, there are the unforeseen expenses, illnesses and accidents that come, as with humans, from just living. The longer your pets live, the more likely you will have non-routine expenses for serious illnesses, periodontal disease, cataracts, urinary infections, senility... There are almost as many possibilities, some less serious than others, as with humans. And for those veterinary treatments, you can pay well into the thousands for treatment. 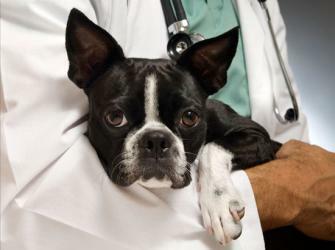 Health insurance for pets is becoming as necessary as human health insurance. If your pet gets sick or is in a scramble with another dog or cat, your expenses will add up in no time. I had a dog that was scratched in the eye, and when it started oozing I rushed him to the vet. She sent me to a veterinary eye specialist, who gave my dog high doses of prednisone to reduce the inflammation. It turned out my dog was allergic to prednisone.... This story is quite long and like many of you reading this, I'm sure you have a story equally painful - both emotionally and financially. I'll summarize this story by telling you that one thing led to another and another and the vet bills totalled more than $10,000 and after treatment my dog became blind in that eye - but I still had to pay for it, and did so by cashing in all of my gold jewelry. I have no more gold or good jewelry. I don't regret having spent that money on my dog, not at all. But what about my newly adopted dog and cat, who are equally precious to me? I have given them a good, loving home; but can I keep them alive if they get sick? Sure, vets can offer you payment plans, but very very few offer a reduction in fees based on your ability to afford them. Today, if your pet gets seriously sick, your vet will tell you that you have three options: pay the expenses out of your savings and/or home mortgage; buy pet insurance; or euthanasia.